The truth about forex trading is that even when a trader accurately predicts market direction they often fail to profit from that knowledge. The thing that stops them from doing that is usually their stop loss. A stop loss triggers at the “wrong time” and throws out the trade before it has had chance to move into profit. Sounds familiar? If you’re using stop losses in your trading strategy and they’re working for you then all well and good. However if you think there’s room for improvement, and there nearly always is, its well-worth spending a bit of time looking at some of the alternatives to stop losses. Trading without stop losses might sound like the riskiest thing there is. A bit like going mountaineering without safety gear. Yet with the right risk-control in place it’s not as crazy as it first sounds. Moreover, as I explain below your stop losses may not actually be providing you with the protection that you think they are. The natural reaction when traders try to reduce the numbers of stopped-out trades is to widen their stop losses. But there is a law of diminishing returns in doing this. Figure-1 shows how wide the stop loss needs to be versus the probability of the stop being reached. This example is for EURUSD over a 12 hour time frame but that’s not important. What’s important is the shape of the curve. The curve increases exponentially. This means you need a correspondingly bigger and bigger stop loss to reduce the chances of it being reached. For example, if you want a 50% chance of the stop loss being reached after 12 hours you would need a 45-pip stop distance. If you want a 25% chance, the stop distance has to increase to 72 pips. That’s a jump of 27-pips for a 25% reduction. Further along the curve, for a 2% chance of stop-out, the stop needs to increase to 142 pips. Then if you want to reduce that to a 1% chance, the stop has to increase to 215 pips. That’s a step of 73-pips for just a 1% reduction in the chance of the stop being reached. The further along the curve you go, the bigger the jump needed to get to lower stop-out percentages. Narrowing that last 1% requires an enormous stop distance for hardly any gain. To see how these curves are calculated see here. Not all traders use stop losses, for one because there are often better ways of managing risk, such as with hedging as we’ll see below. 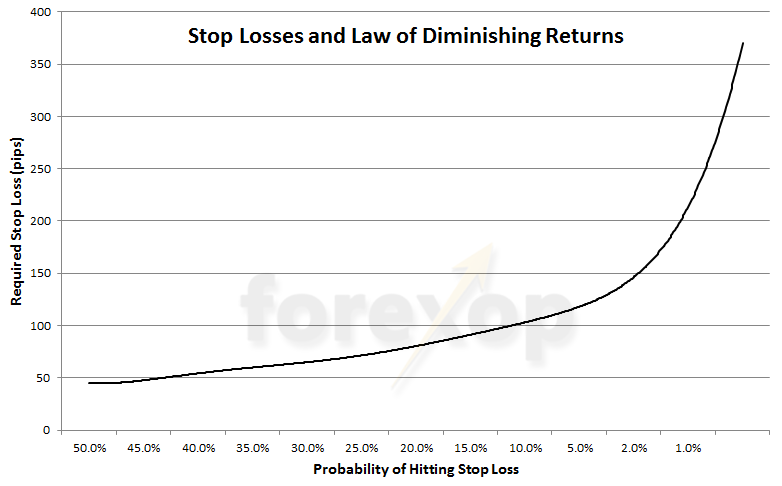 But first, here are some of the arguments against using stop losses. If your broker is a dealer they’re also making a market for you. Unlike an ordinary broker a broker-dealer can take market risk. That means they may not be entirely impartial. They could potentially be on the other side of your trade or those of many other clients. This means your loss is their profit. When the dealer can see at what price orders are set to exit, that gives them an unfair advantage. It’s doubtful that a retail forex dealer – a minor player in the league of things – could single-handily move a currency pair. They just don’t have the muscle to swing the market to eat-up stop losses in pacman-like fashion. Nevertheless a dealer could easily open their spread to capture bunches of nearby stops – if they really wanted to. Given the kinds of legal actions we’ve seen regulators take against some brokers, this doesn’t seem too far-fetched. When the price is the same, a widening spread can only ever trigger a stop-loss. It can’t trigger a take-profit. Therefore if the spread is fluctuating it’s far more probable to have a trade stopped-out rather than reaching a take profit. The spread disparity greatly increases the ratio of stopped trades to profit trades – even when the stop and profit distance is the same. This is why many forex trades on the retail side end in loss. How many times have you looked at a trade that’s been stopped out only to see the market happily moving in the direction you first predicted? This happens classically when a volatility spike fires a stop loss, and so closes the position. Far from being smooth and orderly, forex pairs have a tendency for bursts of high volatility. Spikes and single candle events are where the bid/ask price makes a large step-change. These events are common at breakouts. These fake-outs are where the market makes a false break in the other direction before eventually reversing. Spreads are also on the rise which further increases the chance of a stop out (see above point). Most trading strategies will hold more than one trading position. So given that most markets are correlated to some point, does it make sense to manage stop losses independently? In this case a trader may be quite relaxed about a loss on one trade, where it’s compensated for by a profit on another. This is ordinary hedging. With some strategies, hedging can be a safer and more reliable way of protecting downside losses than stop losses. Some say that trading with stop losses leads to lax analysis and sloppy trading. Perhaps this is because the trader subconsciously sees the stop loss as a safety net. In the same way that riding a bike with safety stabilizers could make you over-confident as well as more prone to take uncalculated risks. The trader without stop losses might be more prudent in the choice of trade, money management, and the control and monitoring for the account. This final point is the killer. Far from being a guaranteed safety net, a stop loss is only as good as your broker’s ability to exit the trade at your stop price. When the market collapses and liquidity dries up – something that happens from time to time – a trade will exit at the first price it happens to hit. That could be many percentage points away from a stop out level, potentially leaving you with massive losses. Here are some alternative ways you can protect downside losses without using broker stop losses. It comes with caution though. Omitting stop losses should only be done with full consideration of the risks and after careful testing. With dynamic stop loses you need a piece of software to keep watch on your account such as an expert advisor. The software continually checks the floating losses on open trade positions. When a loss-limit is reached, one or more of the positions is automatically closed. This limits downside losses on the account. Dynamic stop losses allow for much more flexibility than broker-side stops because the software can apply any logic that you want. The main risk of using dynamic stops is that for some reason the software fails and allows large losses to accrue before they’re noticed. Hedging means that one trade position is covered by another. In a straight hedge for example a long EURUSD position is covered entirely by a short EURUSD position of equal size. The difference between the two determines the profit – but once both trades are in place the profit or loss is locked at that amount. With a more practical hedging strategy a trader would use different currency pairs as well as other instruments to create a basket that has lower volatility with improved risk-adjusted returns. Ideally they will also use a VAR calculator to estimate the account exposure. This checks the overall effect of hedging between each position in the account. Options can be a great way to protect downside losses in place of stop losses. They do require a bit more planning but once mastered can offer at least as much protection. With this approach the trader buys out of the money call or put options that will cap the downside losses on one position or even on the entire account. An out of the money put option works like a wide stop loss on a long position. While an out of the money call option works like a wide stop loss on a short position. But options do have a cost even though by using out of the money options this cost is relatively small. In a worst case scenario if your positions go south the options will pay out and protect against the downside. Some traders who’re sitting at the screen all day may forego stop losses altogether. A scalper for example would look to make only a few pips on each trade. Each position may only be open for a few minutes or hours. During this time the trader is monitoring it closely and is ready to react if it goes into the red. There’s a final more basic way to trade without stop losses. That is simply to hold a small reserve balance in your trading account. You then rely on your broker to tell you when your margin limit is approaching – that’s assuming they do give you notice, not all do. Not surprisingly this is not recommended. 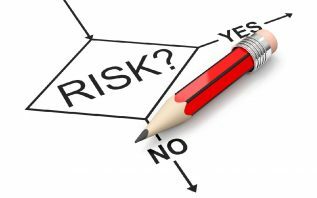 The risk is that you may not be around when your broker calls or emails, so you won’t have enough time to do anything about it. That means that your broker may close out your trades at prices that are highly disadvantageous to you. There’s also the chance that you can run a negative balance. That may also attract penalty fees. As I’ve shown, while stop losses seem like an easy and safe choice, there can be some significant drawbacks in using them. Stop losses might be the right choice for some strategies but not others. It isn’t a given to use stops because there are alternative and often more precise ways of managing risks. As a final point if your risk control relies on your own systems, it is generally best-practice to place wide broker-side stop losses anyway. These act as a failsafe just in case your other methods fail. 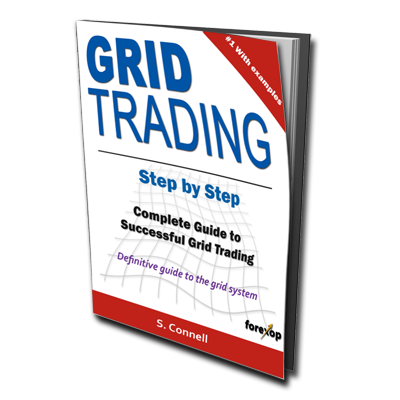 Trading without a stop loss doesn’t mean keeping Your stop loss hidden with a software. It means exiting Your position on an exit signal whether You are in gain or in loss. Eg. exiting on a moving average or on a stochastic signal.